This is the same comfortable nose clip as the one with the strap, soft pads and a memory plastic frame to hold its shape. This noseclip has a siicone cord that goes around the neck along with very soft pads for complete comfort and a memory plastic frame to hold its shape. Anatomic design fits profile of the nose. High quality nylon material for prolonged life. Silicon pads offer maximum comfort. Dual purpose to seal out noise with a noise reduction rating of 27 decibels (highest ever for a flanged earplug) and exceptional ability to seal out water. Super soft seal rings are incredibly soft for extreme comfort. Two plastics used in the molding process allow for the ease of insertion and unmatched comfort. Includes shatter-proof carrying case and removable cord. 1 pair per box. The ultimate in earplug comfort, Mack's silicone putty molds to the unique contours of any ear. 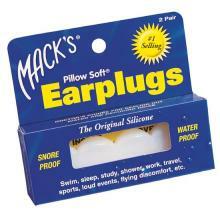 All Mack's Pillow Soft silicone earplugs are doctor recommended to seal out water, help prevent swimmer's ear, provide protection after surgeries, help relieve flying discomfort, and protect hearing from louad noises. They are a non-toxic, non-allergenic protection. Includes plastic carrying case. White. Two pair per box. The ultimate in earplug comfort, Mack's silicone putty molds to the unique contours of any ear. 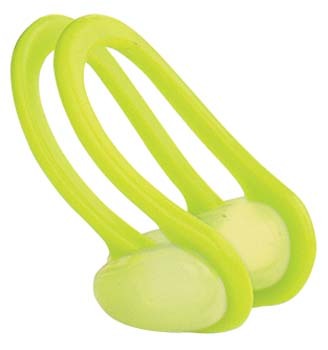 All Mack's Pillow Soft silicone earplugs are doctor recommended to seal out water, help prevent swimmer's ear, provide protection after surgeries, help relieve flying discomfort, and protect hearing from louad noises. They are a non-toxic, non-allergenic protection. Kids size provides better seal, accomodates all kids' ear sizes, and are a bright color that is fun for kids and easy for parents to see. Includes plastic carrying case. Hot Orange. Six pair per box. 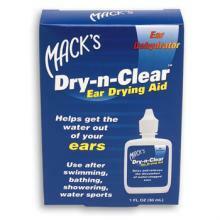 Help relieve the discomfort of water-clogged ears from swimming, bathing, showering, and water sports by drying excess water. Formulated with a unique moisturizing agent that helps dry excess water while conditioning the delicate lining of the ear canal. Convenient, comfortable, oval shaped dropper/applicator is ready to go out of the package. No bottle assembly required. Bottle comes with a tamper-proof seal. DEVELOPED BY AN OTOLARYNGOLOGIST FOR THE PERSON NEEDING TO USE EAR PLUGS. EXTRA PROTECTION IS NEEDED TO SECURE THE EARPLUGS. IT IS SPECIALLY DESIGNED NEOPRENE HEAD BAND WORN AROUNT THE BACK OF THE NECK AND OVER THE EARS TO KEEP THE WATER OUT WITHOUT WEARING A CAP. ADJUSTABLE FOR COMFORT. HELPS ALL EAR PROTECTION DEVICES TO STAY SECURE. THIS IS THE NEWER VERSION WITH A WIDER COVERAGE OVER THE EAR AND BETTER WIDER VELDRO FOR A MORE SECURE FIT.